Click the Image above to view the 2019 calendar and info (PDF). Recycling is mandatory in Center Township as well as the state of Pennsylvania. 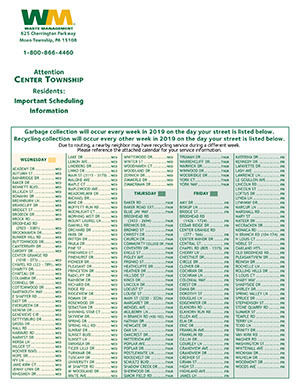 Collection service can be set up by calling Waste Management at 1-800-866-4460. Collection day is Wednesday. Recyclables are picked up every other Wednesday. Recycling Bins are available in the township office for $10.00. Never place recyclables in plastic bags they might be discarded with the garbage. Need/want to know when the Center Township Yard Waste Recycling Site will open? View complete details by visiting our Center Township Yard Waste Recycling Site.